Your Number One Source For Sarasota Murphy Beds, Custom Home Office Furniture & Closet Systems! At More Space Place Sarasota, Furniture Shopping is Different! Here at More Space Place Sarasota, we focus on multi-functional, space-saving furniture solutions that will transform your home and make your life a little bit easier. We understand that no two people have the exact same storage and organizational needs, which is why each of our custom furniture solutions is personalized to your exact specifications. Whether you live in Bradenton and want to make your utility room functional, or you want to amp up your Port Charlotte living room with a custom entertainment and media center, More Space Place Sarasota has a solution for you. And with an almost unlimited choice of styles and finishes, we can help you create a furniture system that can complement any decor, whether it’s traditional, contemporary, or transitional. Design doesn’t have to be a hassle, we make it fun! Great design is always subjective, and what’s perfect for you might not be the ideal solution for someone else. 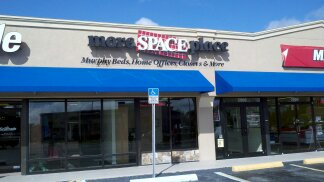 At More Space Place Sarasota, we know that custom furniture solutions need to match each individual’s needs. We listen to the issues you’re currently having with organization or space optimization in your home, and we offer creative, affordable solutions that will be manufactured to your exact specifications. We can also ensure that your custom furniture system will be a beautiful accent to the existing decor of your home because we offer such a wide variety of colors and finishes for our custom pieces. Our design consultants will work with you at our store or in your home to provide you with a design that meets all of your needs and exceed your expectations. We do this by providing you with numerous design, color, and cost options. Whether you want a basic, affordable Murphy Bed for your Sarasota home, or you want to create a cutting-edge custom closet in Bradenton, More Space Place is here to help. Because each furniture solution is manufactured independently, the process can take from a couple of weeks to a couple of months, depending on the materials being used. When your custom furniture is ready , it will be installed by one of our certified More Space Place Sarasota installers who will make sure your furniture is installed properly and provide you with the custom-built look that you’ve always envisioned. Contact us for your Sarasota Murphy bed and closet system needs! Mon. - Fri.: 9:30 a.m. to 5:30 p.m. Sat. 9:30 a.m. to 4:00 p.m.